In the remote Ningunsaw Valley described by Deanna Kawatski in her remarkable memoir of an unlikely friendship, Clara and Me, a bottle of ketchup was a luxury item. Persevering in the bush with two children approximately 120 miles from the nearest town of Stewart, B.C., her family had to hike three miles over a rough, bog-riddled trail to reach the nearest gravel road in order to hitchhike to ‘civilization’. They routinely wore hand-me-downs. She and her husband Jay had a combined annual income of five thousand dollars — for his woodcarvings, taxidermy and snowshoe making, and for her freelance magazine articles. But Kawatski’s greatest poverty was female friendship. “For eleven years I had dreamed of having another woman within walking distance,” she writes in Clara and Me: The Story of an Unexpected Friendship (Whitecap 1996). Kawatski’s wish was granted in 1990, but fate made a mockery of her vision. Raised among sophisticated peers in Kamloops, Kawatski had naturally yearned for a woman to share her literary concerns. Instead her neighbour for the next two years would be Clara, a ‘small bent twig of a native woman’ with no visible teeth to support her idiotic grin. Barely able to speak, Clara was the mentally challenged wife of Fritz Handel, her ingenious and kindly protector. 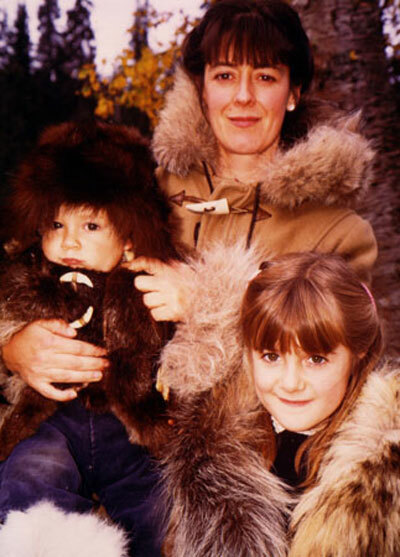 Deanna Kawatski with her kids. “In some ways Clara had it made,” says Kawatski. “She had love, security, and far more freedom, both mentally and physically, than I had. Kawatski’s husband resented her writing. She rose as early as 4:30 a.m. to work on her gardening journal. As their difficult marriage became an isolated battleground, Kawatski increasingly turned to her outings with Clara to escape her husband’s criticism and expand her emotional horizons. Particularly on their snowshoeing expeditions — which “held the rhythm of wading through clouds” — or taking their children to the river, Kawatski and Clara bonded with Mother Nature and their natures as mothers. To thwart her increasing success as a freelancer, Kawatski’s husband served an ultimatum in writing: stop writing or see a lawyer for a divorce. 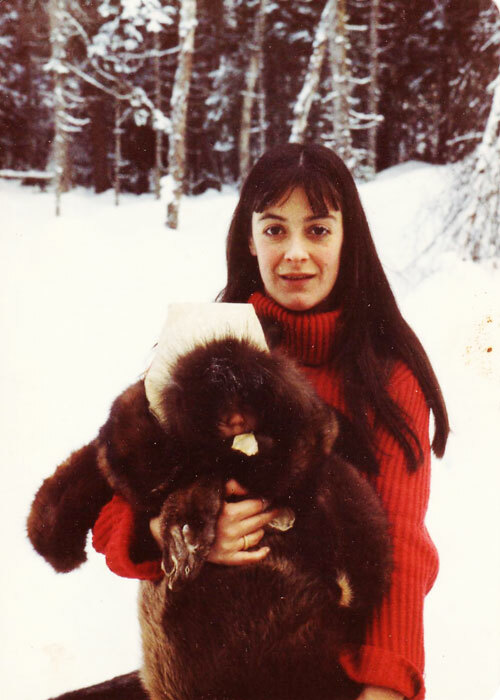 In support of Deanna Kawatski’s need to leave Ningunsaw Valley, Fritz Handel and Clara also left their home, returning to the bush north of Iskut Village. Kawatski’s Wilderness Mother became a Book of the Month selection in 1994. 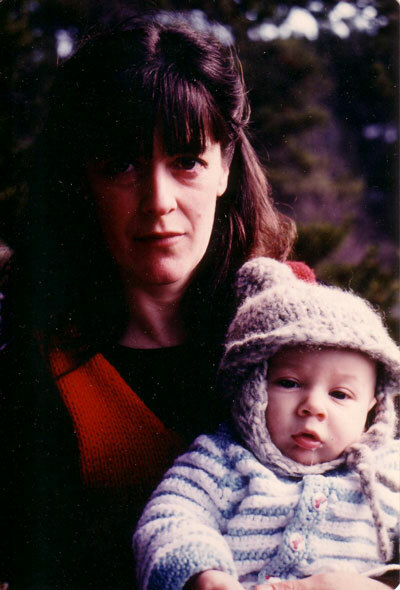 Clara and Me was shortlisted for the Hubert Evans Award in 1997. Having been a contributing editor to Mother Earth News, Deanna Kawatski now lives on a farm at Shuswap Lake with her daughter and son, and new partner, Eric. “From Clara I learned patience, tolerance, and the capacity to stand up for myself more often. She showed me that no matter how uneducated or intellectually stunted we are, somewhere within dwells a spirit with clenched fist and chin held high, which will rise in defence of itself. “Call it human dignity or the survival instinct. Without it we won’t survive in our full capacity. The soul light can be turned down to a mere flicker by the blackness of oppression. Clara reminded me that I had rights and not to tolerate their violation. Deanna Kawatski was contacted by friends on April 21, 2012 to let her know that Fritz and Clara’s snowmobile went through the ice on Lake Kluachon, at the headwaters of the Iskut River. Fritz fought for their lives for an hour and twenty minutes but Clara did not survive. “It is unbelievable that Fritz could live in the icy water for so long,” she said. Fritz was only rescued because a couple of men making a dump run, (on an out-of-routine day) spotted something bobbing in the lake and, thinking it must be an animal, investigated. The men risked their own lives since it took poles and ropes to execute the rescue. Fritz was medivacked to the hospital in Terrace about three hundred miles south and he survived. Burning Man, Slaying Dragon: My True & Transformative Travel Tale (Gracesprings Collective 2012) is a dual memoir that recalls Kawatski’s overland trip to India via Turkey as a young hippie at age 21 as she simultaneously narrates her much later journey to the Burning Man Festival at the Black Rock Desert in Nevada with her 23-year-old daughter Natalia. Reflecting back on her comments, Kawatski couldn’t recall what exactly made her come to that conclusion. However, she does know, that writing is tough. “Everybody secretly thinks they can write a book. They have no idea,” she said and then she laughs. Yet, Kawatski said, many people are flooding the literary scene with inferior works because they don’t realize what is needed to produce a quality book. While she admitted her comment might not be popular, she wishes those would-be authors would spend more time acquiring writing skills before attempting to publish their material. “I just read it over the other day, “ she said, letting loose another peal of laughter at her youthful writing. A chance encounter with W. O. Mitchell helped Kawatski realize the need to develop her own literary skills. She was on a plane in 1974, when the man sitting beside her noticed her scribbling in her journal — something she continues to do daily. Writing a popular book should not be new to her. Wilderness Mother is described in writing circles as a classic, and Clara and Me touches the heart of anyone who reads it. But she still delights in knowing people appreciate her stories. When a book is published professionally, the author gets $2.50 if the book sells for $25. That’s one of the advantages of self publishing, although the author also has all the costs of printing. Fortunately, she said, she has always lived frugally so she’s doing OK.
And is she really done with writing? Procunier can relax. He’s right. It’s who she is. “I have a lot of stories left to tell,” she confessed. When she is not writing, Deanna Barnhardt Kawatski is engaged in other literary pursuits. She gives writing workshops, makes presentations at workshops, attends writers’ retreats and festivals, and gives readings. 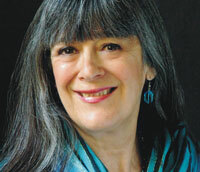 Since Wilderness Mother was published in 1994, she has given 65 readings. Her next reading featuring passages of Stalking The Wild Heart is Nov. 28 at Vertigo Gallery in Vernon from 1 p.m. to 2 p.m. Kawatski’s books are available in Kamloops at Chapter’s, Bookland and Second Glance for $28. A travel memoir, Burning Man, Slaying Dragon, which includes the story of how she and her twin sister, Donna, ended up travelling to Berlin at age 20, along with Donna’s new baby. What do you do when you’re approaching fifty and your twenty-something daughter invites you to an arts-festival adventure for which the tickets state, “You voluntarily assume the risk of serious injury or death by attending”? However, it’s not only local forest conflagrations and the blazing creativity of artists gathered in the scorching heat of the Nevada desert that Barnhardt-Kawatski must confront and survive. Breathing deeply into her past, she also must face, once again, the suffocating anxiety and searing self-doubt that threatened to consume her when she was a young woman. Three decades earlier, in a courageous attempt to extinguish these inner fears, the author had also chosen to leave her Shuswap home. She headed for Europe and from there, made her way through the feverish intensities of the Middle East to complete her journey in the crucible of India. Barnhardt-Kawatski demonstrates her considerable skills as she deftly interlaces the two stories of past and present. In this “true & transformative travel tale”, the writer’s attention to detail and her willingness to tell the whole and unvarnished truth engages the reader at a deeply personal level. But she also beautifully illustrates that all true literature tells a story beyond the apparent narrative.